Below our home and out back behind the old barns, which are falling down plank by plank from the drilling of the wood bees, there is a pokeweed forest growing. An old cedar came down two winters ago, and it seems all these dormant poke seeds finally saw the light to germinate. Poke, Phytolacca americana, or Shang lu, is a striking and irresistible plant. It is alluring as it matures and streaks purple into its stems, growing clusters of creamy blossoms and then the berries, deep purple with fuchsia stems, staining fingers vibrant pink. How can anyone resist this toxic plant? Its beauty has probably been the reason people have persisted in discovering its uses as food and medicine. This is the end of October, and I have just harvested the last of the berries, leaving many for the bears and the birds. Poke has been used as medicine, food and dye around the world for hundreds of years. In the Appalachia, they make poke greens “sallat,” (by picking shoots before purple/red streaks appear, at about 6″ tall), poke berry jelly, poke root oil, and pokeberry water. The root in TCM is called Shang lu, and it is bitter, cold to neutral, downward directing, toxic, and to be used with great caution. It enters the Bladder, Kidney, Large Intestine, Spleen, and Lung. It is traditionally used to treat edema in the upper, middle, and lower burners, with its action of strongly unblocking the water gates and promoting movement of catabolic wastes. In large doses poke root may cause diarrhea, vomiting, and in larger doses it may cause respiratory failure and death. Poke is also traditionally used as a lymph cleanser and mover for glandular inflammations, such as mononucleosis, mastitis, swollen glands in the armpit, throat and neck, and for dissolving cysts in the ovaries or fatty tumors elsewhere in the body. Internally taken as a tincture, its traditional use is 1–10 drops 1–3x/day. It is also made into an oil and used topically over affected areas. The berries are traditionally used similarly in a tincture, a jelly or pokeberry water to stave off rheumatism, aid in recovery from the flu, and to support healthy immune functioning. Pokeberry is traditionally used similarly to or in combination with red root and cleavers. It is believed that now is a good time of year to make this medicine, for we are headed into winter, where the cold and our slightly more sedentary lifestyle and richer foods can cause things to move slower and accumulate in our lymph and glandular system. People will also use it in the spring when they may be ready to cleanse winter accumulations. This year I made a delicious jelly and a tincture of the berries. I am waiting a bit longer to harvest the root to make a root oil and tincture. The seeds within the juicy pink berries are toxic, but the fruit is not. Here are a few recipes where can you avoid the seeds, and utilize fruit only. Bring to boil and simmer 20 mins. Eat a little per day as needed (see caution below). Place 10 or so berries in a quart of water, and leave overnight. Strain the next morning, and drink 1/2 cup everyday for four days (see caution below). According to traditional use, this may help prevent rheumatisms and promote immune-recovery and strength. Another traditional use of the berries medicinally for helping arthritis and other inflammations is to swallow one whole berry per day for seven days, adding one berry each day until you are up to seven berries in seven days. Then tapering down one berry per day from seven, six, five, etc., to one berry daily (see caution below). The word toxic can be a strong deterrent to medicine, but it is important to learn how to use this prolific plant safely. And truly, all plants are to be used with caution, for they can create a unique, possibly adverse dynamic within each person’s bio-region! Always start with the smallest doses, check in with your care provider before starting any new health regimen, and observe your body. If rashes appear, or abdominal discomfort occurs, discontinue use and contact your care provider. Thanks to the many before us who figured out the diverse poke uses. May this article promote aware, wise and cautious use of what we have available, outside our back doors. I am trying the berries for a sudden onset of arthritis. Came to me so fast, I’m afraid it’s rheumatoid. I am on day 3, 3 berries a day, and my hands felt better this morning than they have in weeks. You mentioned making a tincture of berries. What ratio do you use? I couldn’t find 100 proof pure grain alcohol, just 180 proof. I didn’t know if I should water down, so I bought 100 proof vodka. Will this work okay? I am so happy to”discover” all the healing properties of this beautiful plant. My grandparents were from mountains of Kentucky and ate poke boiled then fried. And my grandmother would peel and slice the stems, roll in cornmeal and fry like okra. They had heard of neighbors making pokeberry jelly, but were afraid to try that, so I was raised to believe they were poison. I am just learning about some basic medicinal plants in our area, and I am going slowly, being very cautious. Thank you for your information! So Sorry Susan for the delayed reply! Just getting my barrings navigating my site! How did you do the whole seven days of poke berries? A tincture can be made the home/folk way with filling your jar with fresh berries and covering them with alcohol. Vodka makes a nice tincture, at 80 proof or 100 proof. Hope this helps! Please keep me posted. And I would love your family poke salat recipes! Hi, can you advise how to use the tincture for arthritis? How much, how often? Might gin work OK? A dear knitter friend make a dye for her yarn. It is in season here now. Just remember the seeds are the poisonous part! Would love you to share what you end up making! Hi there, thank you very much for the information and your recipes and I’m so I ran into your website. I live in New York City and had these plants growing in my back yard for years and didn’t know what to do with them till recently. Every so often I would taste a berry and to my surprise, they were pretty good and yummy. I’m going to take a crack at all the above recipes and eventually make the essential oil as well. I will be using a commercial bought 192 proof grain alcohol, which is, 96% alcohol content by volume. My question to you is, what would be a sufficient amount of pokeberry soaking time before being able to enjoy this most wonderful tincture / cordial. Also, would the alcohol be able to extract the toxins from the seeds at any giving time. When you macerate the poke berries, meaning soak in alcohol, do not break the berries, leave them whole. If you notice the seeds they have a pretty hard outer skin, that is difficult to penetrate. But to be safe soak em whole. Thanks for your inquiry! I have arthritis, thinking of trying this when the ripen here,thanks for the great article! ! My question is in regards to the jelly… At the end of your recipe, it says “eat a little per day as needed” what would the serving size be for the jelly per day? Is it safe to eat every day? Does it work for medicinal purposes? Thank you. Yes, it can work, but of course you have the sugar. Sugar in many healing ways is a vehicle to carry healing. I would say a teaspoon per day would be sufficient. Thanks for your inquiry! This plant is very dangerous and can kill children with as little as one berry. I cannot believe that people would recommend or use this medically! If you want to gamble with your lives then go ahead and risk it but you never know how much of any chemical is in a plant part and you can easilly poison yourself and others, even children and animals without realizing it, and it may takes days or more to see the result! In safe mature hands maybe you can make a medicine yes but I am no doctor and I just know how dangerous this plant is! Hello Jason, Thank you for you comment. I strongly encourage cautious use of any plant, and proper id first and foremost. And I am certainly not suggesting this is safe for children. There are many sources that speak of the toxins, yes, and if one were to eat the fresh spring tender leaves, it is suggested to do several boilings. The peoples of the south have used this plant in many ways for generations. And in terms of the berries, it is recommended to swallow them, for the toxins are in the seeds, which cannot be digested by our guts, and come out whole. 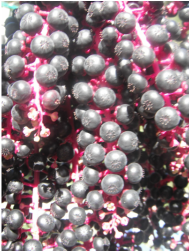 Here is an article http://www.herbalrootszine.com/articles/elderberry-vs-pokeberry. And there are many. Birds eat these regularly and are the main seed distributor, for they are undigested and dropped to germinate elsewhere. Thank you again for bringing up the important aspect of being safe with plants. or just “heard” of the dangers. Could you explain “how you know”? a hot dressing on raw leaves, with no ill effects. “It gave me the trots.” Ha! i have a poke berry plant growing in my veggie garden of all places! i thought i had pulled it out last fall, but it’s back… after reading again of the benefits, i have decided to let it be. when you say to eat a berry, is it when they are purple or still green (or does it matter)? They are ripe when they are purple. Yes, use them when they are ripe. My mom is 82 years old and suffers from arthritis. Someone told me that if I could find some polk berry wine and use it for medicinal purposes that it would help. I can’t find the recipe or the wine. Will the water work just as well?